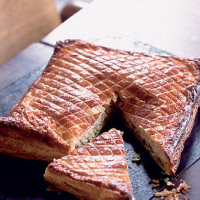 This deliciously moreish, flaky pie is a mildly cheesy version of the famous flamiche of Picardy, in northern France, where the filling is more usually a simple mixture of chopped leeks, butter and a little cream. Preheat the oven to 200°C, gas mark 6 and place a flat baking sheet on the middle shelf. Remove the pastry from its plastic wrapping (set this aside), cut it into 2 equal parts, then gently roll into slightly thinner 25cm squares. Put one onto a lightly buttered baking sheet, cover with the plastic wrapping and put the other pastry sheet on top. Chill for 30 minutes. Meanwhile, melt the butter in a frying pan, add the leeks and cook for about 20 minutes, or until they are soft. Mix together the cream cheese, cream, nutmeg and chives in a small bowl. Mix in the leeks and leave to cool. Remove the pastry from the fridge and set aside the top sheet on the plastic wrapping. Spread the cooled leeks over the pastry base, leaving a 2cm edge uncovered. Scatter with the Parmesan and paint the edge with the egg yolk. Form a lid with the other square of pastry and allow the edge of this to flop down onto the bottom layer. Press together lightly. Brush the top with more beaten egg and press the edges together with a fork; trim the sides to neaten. Make a few small cuts in the centre of the pie to allow steam to escape. Decorate with the point of a knife, in a criss-cross pattern. Slide the pie on the baking sheet into the oven on top of the pre-heated tray. Bake for around 35–40 minutes or until golden brown, puffed and crisp. Allow to cool for 10 minutes. Cut into wedges and serve. The Corker recommends- The complex fruit flavours, bright acidity and gentle sweetness of Riesling lift the richness of the leeks and buttery pastry.